The Bank Holiday Plymouth trip started in the expected way, surfing a mass exodus of people who ‘love London’ but make a break for it as fast as they can at the end of the week. For those driving that meant being stuck in traffic; for the train users amongst us, it meant the lottery of Britain’s railways during Bank Holiday strikes. Regardless, everyone made it to Plymouth safely and in reasonable time and after dispersing to our assigned lodgings, we grabbed some rest and were up bright and early at 7am for breakfast. 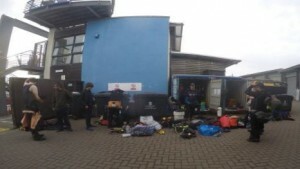 We headed to the container and after a large amount of faffing around, I established that I had no drysuit inflator hose and that I would be missing the first dive which was on The Glen Strathallan. Then a knight in shining armour (it was actually Chris) managed to procure the appropriate hose from InDeep (for free! ), enabling my dreams to come true. We got Blue and Yellow off the pontoons for about 8:30am and were speeding our way to the dive site in no time. I was buddied up with Paul who’d had his empty pint glass spiked with beer the night before and was feeling a little worse for wear, but we got down and had a great time. 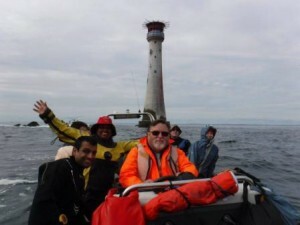 We were right on the boiler and managed to spot a conger, some spider crabs and a large cuttlefish. Then we had a mooch around the debris, and worked our way through some kelp forests until we got cold and decided to come up. Dive two was a mission too far for Paul and he decided to take a stroll around Plymouth. We tagged along with Colin on the Eddystone and we dropped in to one of the best dives of the trip. The surface conditions were a bit choppy, close to the rocks, but under water the vis was great and the setting was stunning. We came across a huge conger, lobster and schools of pollock. Tori spotted an anchor and Colin was on it straight away. 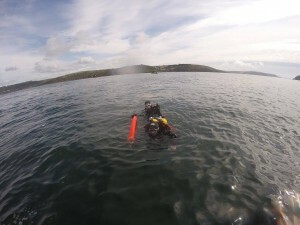 Within seconds the anchor was making its way to the surface, with the aid of two DSMB’s for retrieval later. 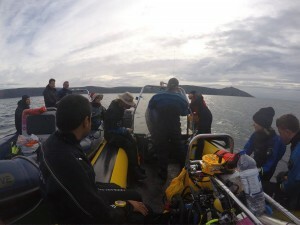 All in all, a great day’s diving. What better way to round off the day than with a couple of pints at the pub then a curry. It was BYO at the restaurant, so we stocked up on warm lagers from the shop next door to wash it all down. After food we had a couple more drinks at the pub, and JD, Colin and Keith finished the night off entertaining us with tales of diving from days gone by. The next day we were up bright and early again to hit the Sound. We headed to the Elk but the vis was less than ideal and the current was a little strong so some buddy pairs didn’t quite find the wreck (despite excellent shot placement). For those that made it they were rewarded with a very atmospheric dive and lots of life clinging to the wreck. The water was somewhat cold – but luckily we were refreshed afterwards with some warm peanut drink… wait, what?! Yes, that’s correct – hot peanut broth to quench our thirst after a chilly dive! 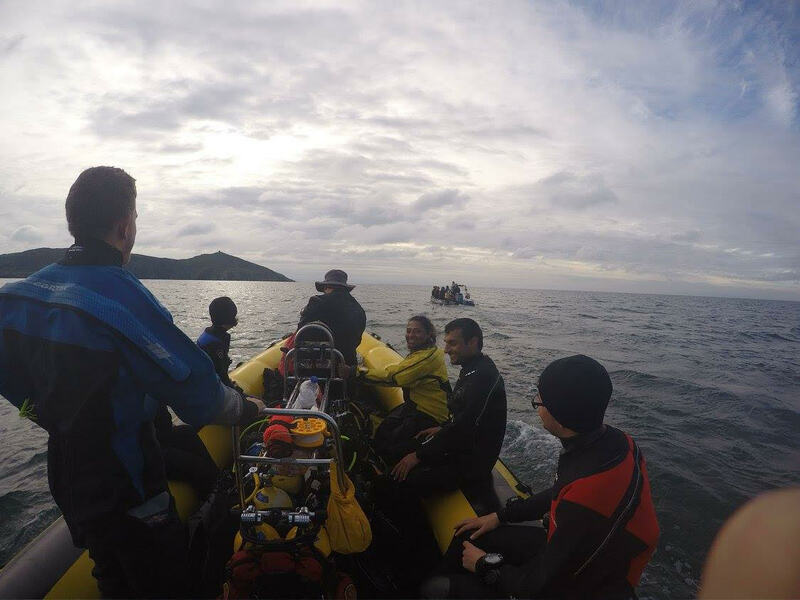 There was uproar on the boat [divers are easily shocked…] and a lot of questions thrown at Rebecca who provided the nutty beverage. We all concluded it was a little too ‘out there’ but at least it provided us with a lot of laughs and it’s always good to try something new, right?! The trip on Yellow was smooth and we got there just before Blue. 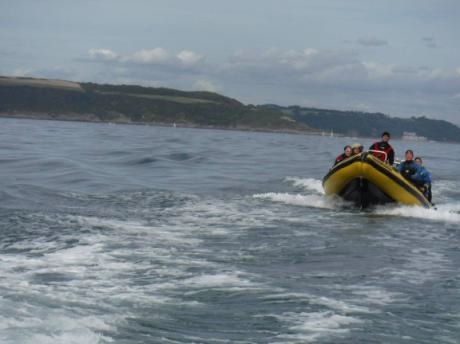 As we slowed down, the engine started to sound a little off and we all quickly realised something wasn’t right. Chris and Bart tried a couple of tactics to get it back on track – but with no luck. When Blue arrived JD jumped on board and had a tinker around. After some time, JD decided the engine would need some work, so we had to call off the dive. The only way back was for Blue to tow Yellow – so we roped up and headed back. Sad times – but at least we could wrap up early and head back to the city before the roads got too gridlocked with returning holiday makers and the trains became fewer and further between. Spirits remained high for the rest of the day and everyone chipped in to get everything cleaned down and packed away. We all united for a final meal at the Hotel Mount Batten and eventually everyone peeled away to go their own separate ways. We’ll catch you next time, James Eagan Layne!